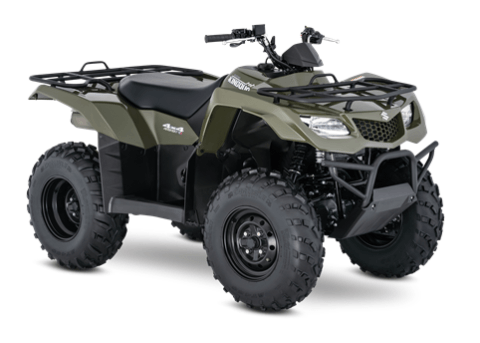 Overall length is under 82 inches (208 cm) so the KingQuad 400FSi 4x4 fits into a 6.5-foot truck bed for easy transportation. Independent front A-arm suspension design offers smooth performance and remarkable ground clearance and allows 6.7 inches (170.1 mm) of wheel travel. A swingarm rear-suspension system with 6.7 inches (170.1 mm) of wheel travel and class-exclusive twin shock absorbers provides agile handling and plush responsiveness. Dual front hydraulic disc brakes feature calipers with a large 34mm piston diameter and maximized brake-pad surface area for increased stopping power and outstanding durability. Large, 25-inch Maxxis tires with aggressive dual-stage treaded pattern offers consistent traction in wet conditions, yet has a quiet, smooth ride on hard-packed trails. 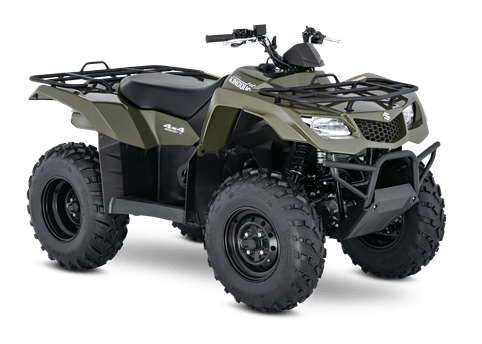 The KingQuad 400FSi features a fuel-injected 376cc four-stroke, four-valve engine with recently refined camshaft profiles and exhaust muffler construction (for more powerful and efficient performance). Suzuki's class-leading fuel injection contributes to smooth power output, especially, in the mid-to-high range, as well as more consistent cold start ability. The fuel injection system uses 3-D ignition maps for optimum ignition, creating a responsive yet environmentally compliant performance. Suzuki Advanced Cooling System (SACS) with a factory-installed oil cooler and thermostat-controlled cooling fan helps cool engine during hard work or hauling heavy cargo. The KingQuad 400FSi has push-button easy electric start. A start-in-gear system—functional when the rear brake is applied—allows the engine to start without shifting to neutral (as conditions permit). A five-speed transmission with semi-automatic clutch with reverse allows the rider to select the ideal gear for maximum traction and fuel efficiency. Wrinkle paint finish on the racks and front bumper is durable and scratch resistance. Heavy-duty front and rear carrying racks let you easily take advantage of the ATV’s superb cargo-carrying capabilities. Large 4.2-gallon (15.9 L) fuel tank with fuel gauge for outstanding riding range. A wide array of Suzuki Genuine Accessories are available for the KingQuad 400FSi, including winches, utility windshield, front and rear bumpers, snow plow, aluminum skid pans, rack extensions, utility box and much more.